Have you considered living in a small solar powered home? If you enjoy small home living and well-designed, sustainable, and modular design, you’ll love this find. 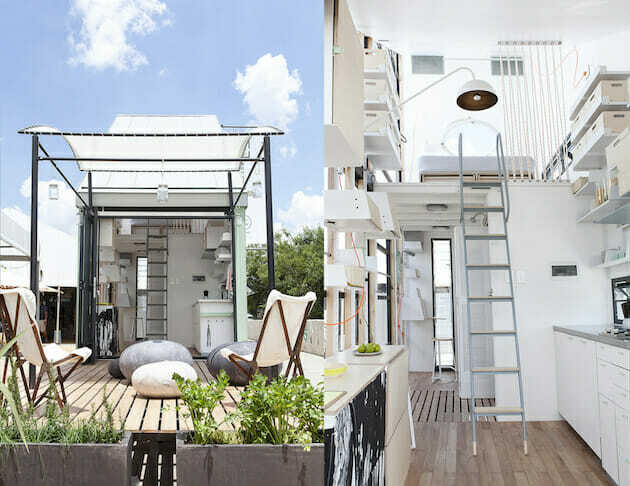 This flat pack, solar powered home from a South African Design team will definitely interest you. Created in collaboration between architect Clara Da Cruz Almeida and designers Katy Taplin and Adriaan Hugo of Dokter and Misses, POD-Idladla is a compact prefab home for two that can move almost anywhere you wish. It is designed in a way to allow its users maximum flexibility as it is both flat pack (for easy transport) and solar powered. It can be easily assembled on site, which means you can switch locations without losing your home. This solar powered home has more than meets the eye! Unlike its predecessor- the Indawo/lifePOD created by the same design duo, this new model features an opaque metal siding rather than transparent plexiglass, and has a modular design the other unit didn’t. Despite its diminutive size, this mobile pod is designed in a way that it can accommodate two people with space for an occasional visitor. However, it can be reconfigured and additional pods can be added to house up-to 12 people. The result is a small 186 square foot bi-level space which boasts of sustainability, ease of living, and quality in every aspect of its design. It is constructed from aluminum, steel, glass and wood, and features a glass front side and number of side windows to promote cross ventilation. The roof of the house is pitched in order to maximize the solar potential and supply the structure’s electrical needs. Moreover, the white and mint green painted facade reflect the harsh sun to keep the house cool from inside and multiple openings and concertina doors allow the exterior and interior spaces to merge allowing a sense of openness and airiness. The choice of white interiors adds to the clean, minimal aesthetic while bold pops such as orange electrical cords and wooden surfaces prevent a feeling of monotony. To keep the clutter under control, storage is maximized by making the proper use of available wall space from floor to the ceiling. 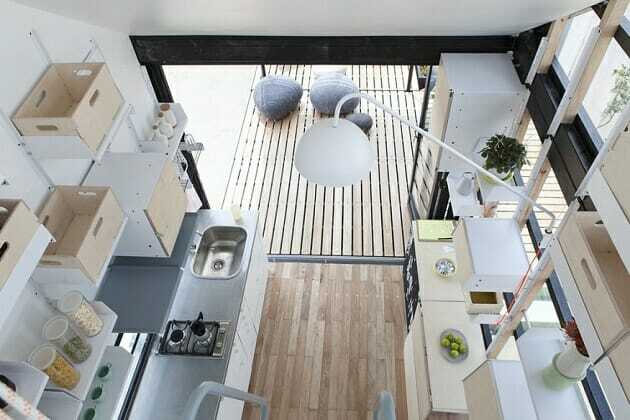 Various smart design interventions are also incorporated such as a fold out table in the kitchen area, two small desks that can be easily flipped up to work as storage units, and of course a mini couch that can be tucked away into various parts of this solar powered home. Built with tall ceilings, the home is divided into two parts which includes an upper loft level easily accessible by a ladder. Areas like office, bathroom, kitchen, dining, and living are located on the first floor, and the bed can be found in the loft. While these are the basic specifications, each home will be customized off-site and tailored to individual client’s specifications before being transported to its destination. At present, its units are available in a single, standard size only for shipping within South Africa. Depending on the additional fixtures such as grey water systems and solar panels, the price of this creative living space ranges from R200 00 to R700 000 (USD$15,765-$55,175). A prototype of POD-idlala is currently on show at the Nirox Foundation Sculpture Park in the Cradle of Humankind in Gauteng. Now who says that living green means compromising on comfort and aesthetics? Would you like to bring home this small solar powered home? Does it inspire you to live a conscious lifestyle with solar power? We’re always thrilled to see how everyday homeowners are leading an eco-friendly lifestyle and builders are thinking differently when constructing homes. 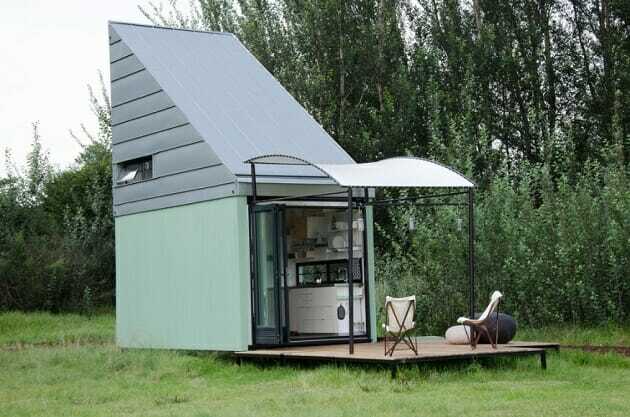 We’d love to hear if you have a solar powered home and how you have taken it to the next level like this small abode!